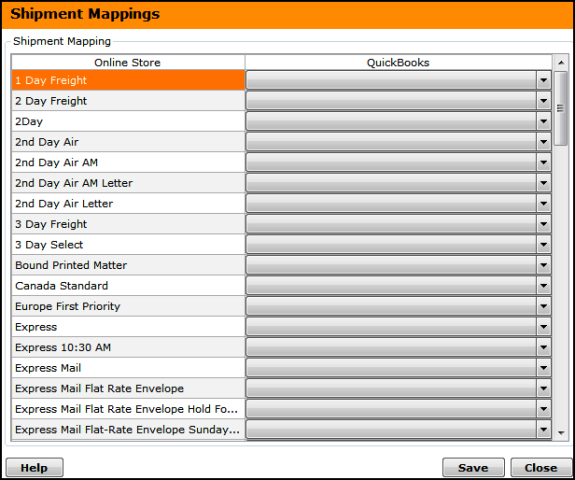 How do I Map my store's shipment method with QB? To map your store's shipment methods with QB, open Unify Desktop and go to File >> Configure Store >> Shipping and click on the Map Shipment methods with QuickBooks button. Use this button to map your online store shipping methods with the Shipping Methods configured in QuickBooks. The left column displays all the shipping methods found in your online store and the right side shows the shipping method that are setup in QuickBooks. Click on SAVE after selecting various mappings.